This course is an introduction to German and is aimed at beginners. Within four weeks, this course will help you to develop basic competencies in listening, speaking, reading, and writing in German, as well as give you a basic knowledge of the German culture, with a particular focus on Berlin. This course is designed to be taken together with our courses in Terms 2, 3 or 4, to give participants maximum value from their time in Berlin. Please take a look at the summer school courses available here. 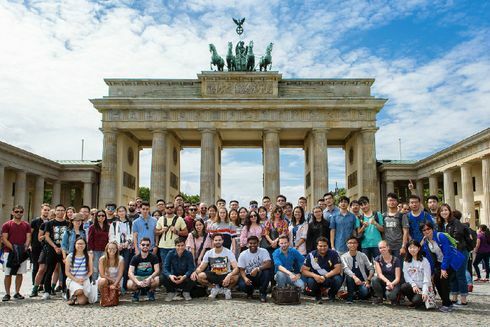 For any students interested in pursuing further education in Germany, an information session on Masters Programs at the TU Berlin will be held during Term 3 of the Summer University. The primary goal of language instruction should be the development of communication. To achieve this, you must engage in as many communicative situations as possible, and the course is designed to provide you with ample opportunities in the classroom and on a course-related excursion to do so. The course follows the standards of the Common European Framework of Reference for Languages (CEFR) for level A1 (beginners with no prior knowledge), which will be achieved by the end of the course. Equal emphasis will be given to five language skills: listening, speaking, reading, writing, and culture. Each class session consists of four modules. It is simply not possible to make satisfactory progress in this or any language course without thorough preparation for class and punctual submission of assignments. Because productive and constructive participation is an integral part of learning a foreign language, it is absolutely necessary that you attend class regularly. You will compose and revise one essay on a given topic. Throughout the term, you will also compose various journal entries to reflect on certain aspects of your stay in Berlin. You will take a midterm and final exam based on course material, consisting of sections on listening and comprehension, vocabulary and grammar, reading comprehension, and composition. You will be asked to prepare a short presentation and speak freely about an assigned topic. You will also work with peers on a creative presentation about your impressions of Berlin. On one course day during the term you will go on a course-related excursion and take an excursion-related quiz. Dr. Jasmin Krakenberg is a Visiting Lecturer of Germanics at the University of Washington, Seattle. She has considerable experience in the classroom at both private and public institutions in Germany and the United States. She has designed and taught courses in communicative and task-based language acquisition at every level, courses that stimulate meaning-focused language use. She holds a Ph.D. in Germanics with a specialization in cinema and media studies. Registrations for summer 2019 will be opening soon. Check back in October for more details.